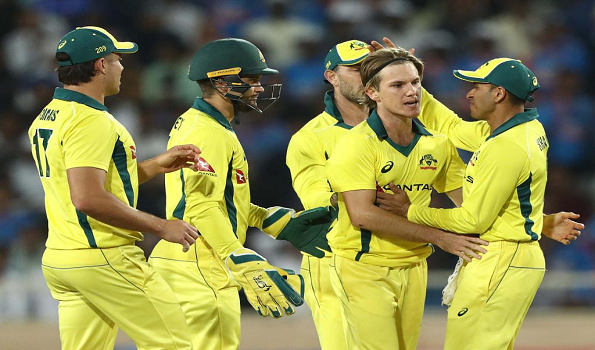 Abu Dhabi: Australia thrashed Pakistan by 180 runs in the third One-Day International (ODI) of the five-match series to get an unassailable lead of 3-0 here at Sheikh Zayed Stadium on Wednesday. On a slow surface, Australia skipper Aaron Finch's 90 runs off 136 balls ( 5 fours, 1 six) and all-rounder Glenn Maxwell's 71 off 55 balls (8 fours, 1 six) helped the visitors to post a challenging total of 266 runs for the lose of six wickets before spinner Adam Zampa (43/4) and pacer Pat Cummins (24/3) jolted the Pakistan batting who were eventually bundled out for 186 runs in 44.4 overs. Chasing a target of 267 runs, Pakistan got off to a worst possible start as they lost their three wickets early. However, skipper Shoaib Malik and opener Imam ul-Haq tried to consolidate their innings as they added 59 runs for the fourth wicket. Maxwell dismissed Haq for 46 runs. Soon, veteran batsman Malik was departed for 32 runs in the form of the fifth wicket.